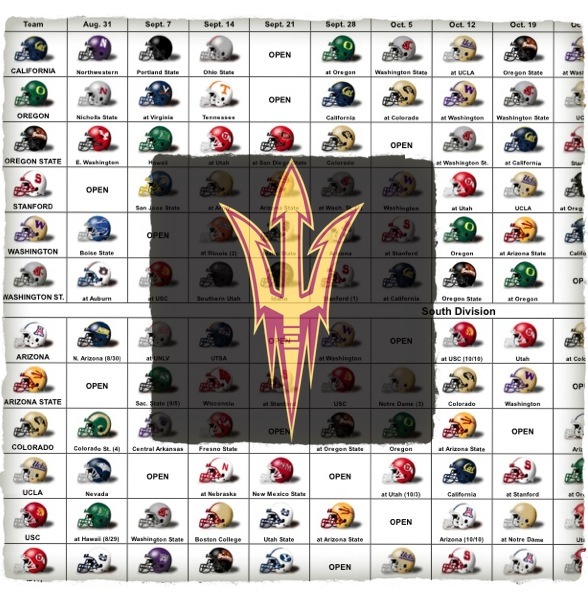 Now that Spring Ball has ended, DieHard Devil will satisfy your Sun Devil Football Fix, otherwise known as “S.D.F.F.” until ASU’s Fall Camp begins on Tuesday, August 2. In the meantime, download your 2013 PAC-12 Helmet schedule and tack it up in your office. It’ll serve as a healthy distraction from the summer heat. Plus, you can get a jump on the seven best tailgates at Sun Devil Stadium next season, all yours of course. The Sun Devils game #1 of fourteen, yep 14, kicks off on Thursday, September 5 when ASU hosts Sacramento State — translated into more helpful terms: in 128 days -or- 4 months, 6 days from today. The 2012, 6-5 Hornets will look to play “sleeper” and rush out of Tempe with an upset over the Maroon & Gold. On the other hand, the team than comes out of Tillman Tunnel that night may be one of the most focused and prepared squads we have seen in quite a long time. Until then, we’re all in this next four months together. Download your own via the link below..